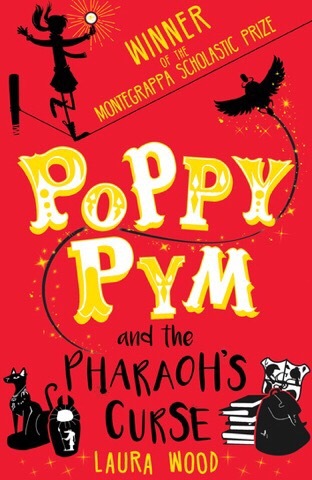 Poppy Pym and the Pharoah’s Curse by Laura Wood is the winner of the Montegrappa Scholastic Prize for new children’s writing, and it’s an excellent debut with a brilliant character in the eponymous Ms Pym who promises many more exciting adventures. Poppy Pym is an orphan, abandoned as a baby and brought up by the performers in Madame Pym’s Spectacular Travelling Circus. She’s had a brilliant life, learning acrobatics and eating candyfloss for breakfast, but as she’s fast approaching twelve years old, her guardians decide that it’s time for her to go to a real school and make friends her own age. Poppy doesn’t understand why she has to go, and she’s worried about fitting in with people who didn’t grow up in a circus. But St. Smithen’s turns out to be by turns intimidating, hostile, friendly, perilous, and downright exciting. Poppy makes friends, and enemies; feels isolated because of her background, then valued for the same reason; but most importantly, she gets caught up in a bona fide mystery that would test the mettle of Dougie Valentine, Poppy’s literary hero. Because when the fabled Van Bothing collection of ancient Egyptian artefacts turns up at St. Smithen’s for an exhibition, strange things start to happen. Could it be the curse of the Pharoah? Or is it something more down-to-earth, but equally sinister? Could someone be after the priceless ruby scarab beetle? It takes all of Poppy’s circus-trained ingenuity, with the help of her new friends Ingrid and Kip, to get to the bottom of the mystery. Poppy herself is an engaging narrator, bright and humorous, and Ingrid and Kip are perfect foils for her. Her phone calls and letters from her circus family are a comic highlight, and I laughed out loud more than once at their antics. Once strange things start happening at school, the plot fairly races along to its conclusion, complete with the requisite red herrings and dead ends of a classic mystery; however, if I had one tiny quibble, it would be that the strange goings-on with the Egyptian artefacts don’t start until nearly half-way through the book. I suppose Poppy has acquired some of Madame Pym’s talent for prognostication, because she keeps reminding us in the first half of the book that “something in my tingling toes was just telling me that there was a mystery here” but in fact there’s very little mystery until the Egyptian collection turns up. That’s a very minor quibble, though. The first half of the book is full of great fun as Poppy settles in to school and builds her friendship with Ingrid and Kip, and contains the hilarious transcript of Poppy’s first phone call to her circus family (“IS GHOST LION. WOOOOOOO.” Haha!) so it keeps you delightfully entertained until the mystery gets under way. The illustrations by Beatrice Bencivenni are fantastic, with posters, photos, brochures, letters, and maps all lovingly included, along with chapter heading illustrations like scarabs, circus tents, and the St. Smithen’s school crest. The bright red cover is very striking, too, and should definitely help it stand out on the shelves of your local bookshop. Which is great, because this book deserves a wide audience so we can have many more fun mystery adventures with Poppy and friends.